With more than 100 scrap yards, Stena Recycling AB is one of the largest scrap and waste recyclers in Sweden. 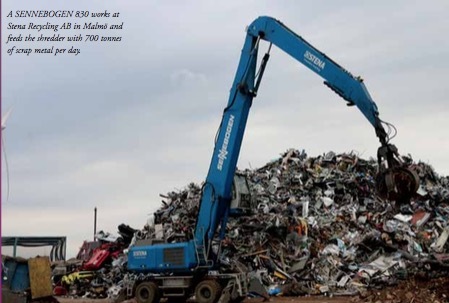 At the scrap yard in Malmo¨, a new SENNEBOGEN 830 has been working since mid 2014 and feeds the longest-working shredder in Sweden. Painted in the blue company colour, the SENNEBOGEN 830 has a 164kW diesel engine and handling equipment along with a multi-shell grab with a maximum range of 17m. To prevent damage to the boom, stick protection was specially attached. Especially when material is thrown far up during loading, the wooden planking prevents the grapple from hitting the stick. The 830 of the current E- Series feeds the large shredder with around 700 tonnes of scrap metal per day, seven days per week. The operators especially like the comfortable, elevating Maxcab, which can be moved vertically by 2.7m and ensures the best possible overview — whether during shredder feeding or truck loading.